As a leading ecommerce order fulfillment company, we’re often approached by our clients and other online merchants regarding multichannel selling. Typically, sellers have questions not only regarding our multichannel order fulfillment capabilities and technology, but also about our experience with different channels, and the best approach when going from a single sales channel to multiple channels. In this post, I’ll discuss when it makes sense to focus on more than one sales channel, how to identify which channels to start with, and how to develop a fitting multichannel sales strategy for your ecommerce business. It may be tempting to launch your products in as many ecommerce channels as possible, as quickly as possible. After all, the more channels, the more sales, right? Not necessarily. As any seasoned ecommerce seller will tell you, there’s a lot of trial and error that goes into optimizing your sourcing, marketing, sales, and order fulfillment strategies. So, by jumping into too many channels too quickly, it can actually have a detrimental impact on your business. – Should you go multichannel with your entire product catalog, or select products to begin with? – Should the price points on your own website match those on various marketplaces? – How will you create brand consistency across all channels, while conforming to marketplace requirements? – How will you generate visibility and traffic to your product listings within each channel? – Once you generate traffic, will your sales pitch vary from channel to channel? – Will your order fulfillment strategy be the same across all channels? – Will your customer service strategy be the same across all channels? Jumping into multiple channels with a one-size-fits-all approach can be problematic. For instance, if your order fulfillment solution for one channel is not scalable to meet the sales demands across all channels, including the speed required to maintain positive seller ratings, it may have a long-lasting, negative effect. The truth is, until you think through the answers to these and other questions, and until you’ve had the opportunity to trial and error various tactics with one sales channel, you may prematurely launch into multiple channels and ultimately do your business more harm than good. Once you’re at a point that you feel things are going well with your primary sales channel, it’s time to start exploring additional sources of revenue. The question is….where to start? We’re all at least somewhat familiar with the big marketplaces out there, including Amazon and eBay. Given the number of buyers, it’s understandable that these are often the first two marketplaces that ecommerce sellers turn to. And while they can be great for business, it’s not all butterflies and rainbows. Here are some pros and cons when it comes to selling on Amazon and eBay…. 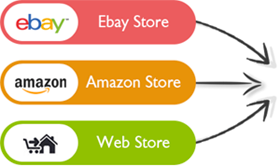 The biggest benefit to selling on Amazon and eBay is the potential for increased sales given the sheer number of people that purchase from these two marketplaces. Amazon currently has quarterly net sales of nearly $30 billion, which is up nearly 30% from last year. And the potential for increased sales doesn’t stop at the border. These marketplaces both have a huge international buyer base. Selling to foreign sellers can add a layer of complexity, particularly relative to the logistics and order fulfillment, but Amazon and eBay do much of the leg work in other areas, and the payoff can be huge. If you go to Google right now and search for a product, chances are, Amazon and/or eBay will show up on the first page. Because of the size and popularity of these marketplaces, they position very well organically within search engines for millions of product-related keywords, which can lead to free marketing for your product listings. In addition, both Amazon and eBay often pay for search engine listings. And if that’s not enough, consider this…a recent study found that more people actually start their product search on Amazon than on Google. You could, of course, argue that it’s not truly “free” marketing, as you have to pay a cut to Amazon and eBay with each sale; however, it’s not a bad deal to only pay for sales, particularly when you consider the relative cost you would have paid on your own to generate those sales. As you grow, Amazon and eBay do provide scalability in some areas to help make it easy. For example, Amazon provides customer service for you. There is, of course, a downside to this, and more on that below under the cons section. They can also help with order fulfillment, although the level of service varies. For instance, eBay will not warehouse your merchandise, but they can provide assistance with international orders through their Global Shipping Program. With Amazon, they do provide warehousing for many products, although the products need to be fast moving and they generally only allow you to carry limited quantities. Because it’s free to list products (up to 50 in the case of eBay), these marketplaces allow merchants to test products and sales tactics, and also to quickly expand on those listings with some support in the areas of marketing, customer service, and logistics. One big con of selling on Amazon and eBay is the marketplace fees you have to pay when selling merchandise. With Amazon, the “referral” fee is generally 15% of the sale. With eBay, it’s generally 10% of the sale, although both marketplaces do have minimums, and the fees do vary by product category. These fees can make it so that it’s simply not viable or worthwhile to sell certain products on these marketplaces. While marketplaces like Amazon and eBay can drive more sales, it’s important to remember that they’re in control, and they put their customers’ interests and their own interests in front of the interests of third-party sellers. Marketplaces generally view the buyers as their customers, not yours, which means they control the communication between you and the buyer, and they also significantly limit the level of branding that you can do. In fact, if Amazon ships your orders, they’re going in an Amazon-branded box. Because of all this, there is typically little to no customer loyalty to your brand….only the marketplaces. For third-party marketplace sellers, they, unfortunately, have to put up with rules that are constantly changing, which typically favor the buyer over the seller. I have heard countless stories of marketplaces that have caused substantial damage to sellers’ businesses due to a new policy, which may be that the marketplace has suddenly banned certain products without warning, or even that the seller is losing sales to the marketplace company. That’s right, some of these marketplaces, like Amazon, are also retailers themselves. And when you sell through them, you provide them with valuable data, and there’s typically nothing to stop them from going out and sourcing that product themselves, and then undercutting you. I’ve talked about some of the pros and cons to selling on Amazon and eBay, but your multichannel sales approach doesn’t have to include those marketplaces, or at least not right away. There are a variety of options out there. Here are just a few…. Did you know that Jet.com just celebrated its one-year anniversary and is now one of the largest marketplaces in the U.S.? Jet incentivizes buyers to build larger baskets and to forgo product returns, which can be favorable to sellers if approached with a smart sales and order fulfillment strategy. While Etsy has now opened the door for mass-produced goods, it is a marketplace that’s been predominately known for unique, handmade, artisan goods. And that still exists today. Etsy is a great place to be for many sellers. While the competition can be fierce in certain categories, Etsy has a loyal customer base and they’ve worked hard to cultivate a supportive community for its sellers. Purchases on Google rolled out about a year ago, officially making Google a marketplace. For years, Google’s driven ecommerce sales through advertisements, but those sales have always took place on another website. Now, for sellers enrolled in Purchases by Google, they are allowing consumers to purchase their products right from a Google-hosted web page after clicking on a product listing ad (PLA). This program is still in invite-only beta testing with larger retailers, but will soon be expanded, and it’s something to keep an eye on. Most of the major social platforms, including Facebook, Pinterest, Twitter, and YouTube, are all experimenting with “buy” buttons so that consumers can purchase products from retailers without leaving the website. Because each of these social platforms has the potential to drive significant sales, and because each requires marketing, customer service, and product fulfillment, they should be evaluated like any other marketplace as part of your multichannel sales plan. By quickly overviewing the options above, I simply wanted to point out that there are a lot of potential channels to drive new sales. And simply because Amazon’s the biggest does not make it the best fit for your business. It’s important to explore all of your options and make sure you understand the intricacies of each, including the audience, fees, policies, as well as branding and marketing options. Without doing your homework, you may jump into a new channel and generate very few sales. But, if you do your homework and launch with a solid strategy, you may have the opposite problem….you simply can’t keep up with all of the new orders. Here are four specific areas to address before you go multichannel…. Will your existing customer service team be able to handle the influx of inquiries that may come from a new sales channel? And if that new channel consists of buyers from other countries, how will you account for different time zones? In general, as merchants expand their presence throughout new channels, they need to make some type of change to their customer service solution, whether that means adding new staff, extending hours, retraining in certain areas, or even outsourcing. This one’s pretty straightforward….do you have the inventory to keep up with sales growth from new channels? And what is the turnaround time with your current inventory? It’s not uncommon for sellers to stock certain products, and to drop ship other ecommerce products. Because drop shipping can often result in additional time to get the orders out, and because most marketplaces require that sellers get orders out the door quickly, merchants often need to re-evaluate their sourcing options as they launch into new channels. Effective inventory management is a big part of multichannel sales success, and to fully optimize your inventory counts, sources, and allocation, it requires ongoing trial and error. Similar to inventory management, order fulfillment plays a big role in your multichannels sales success. I have personally talked with numerous merchants that have been unable to ramp up sales because they do not have confidence in their existing order fulfillment solution. It’s common for sellers to handle their fulfillment in-house for a period of time, or use a smaller, local fulfillment center. Then, when they’re ready to go multichannel or get more aggressive with their marketing, they turn to a fulfillment house that can more easily scale. When you’re trying to keep your customers and support team up-to-date on sales coming in through multiple channels while also managing inventory and a range of vendors, you need software to help. As you evaluate multichannel software providers, it’s important to get a solid handle on where their capabilities start and end. For example, does the software have the ability to sort and route orders to different suppliers? Can the software manage different product IDs across multiple channels? Does it have all of the integrations you require? Do you have the reporting you need to effectively manage your business across all channels? It’s also important to consider pricing. With some software providers, the more SKUs you have, and/or the more orders you process, the more it will cost you. With others, like nChannel, the rate stays the same regardless of SKU or order count. Being successful in one ecommerce sales channel is hard. Being successful is multiple channels is even harder. And if there’s one thing I want readers to take away from this post, it is that it’s much better to be focused 100% on one channel, rather than spreading your resources too thin across multiple channels. Here are some tips to help ecommerce sellers when they are considering a multichannel sales approach, from the channels you should consider, to scalability factors and more. We are launching a B2B and B2C model in dental and body care products for the consumers. We are looking for a solid partner for warehousing and drop shipping. We are interested to learn about your services. Please have the appropriate person contact me. Thank you for the comment, and glad to hear you’re interested in learning more about our warehousing and order fulfillment services. We have a lot of experience with dental and body care products. We’re looking forward to learning more about your business and needs. You can expect to hear from us soon! Ah, so glad you mentioned that before jumping into the race one should be prepared to reach the finish line. Even if you get a head-start, you need great stamina to go all the way. Else, you’ll be eliminated. So, before you start selling on multiple channels, make sure you have the capability to meet the challenges. Understand that first impressions last long, and with customers having so many options these days, any delays in order fulfillment can completely bust your marketing targets.